Hello, You! is an eight-week class for all of you interested in trying stand-up comedy with a storytelling bent. all the way up to the creation of your very own three-minute set which you’ll perform for the class and invited guests at the end of the course. We’ll take risks, build confidence, and find out how to sharpen those stories that make family and co-workers laugh into comic gold fit for an audience of strangers. your own unique brand of funny while you strengthen your authentic presence and voice. ​Say “Hello!” to that part of you that’s been waiting for her (or his or their) moment at the mic all this time. About Kelsey Flynn: Kelsey Flynn began her career in improv comedy in 1989 when she was a founding member of Smith College’s improv troupe, the Smith Improv Komedy Organization (SIKOs-pronounced “sickos.”) Over these past almost 30 years, she has performed in clubs and festivals and studied across the Great Comedy Map of the United States (GCMUS-pronounced ‘gick-moose’) including places like Chicago, New York, Seattle, and Sayre, Pennsylvania. Kelsey’s improv comedy background prepared her well for a stand-up comedy adventure that began in San Francisco in 1995 at an open mic night at Josie’s Juice Joint and Cabaret. That’s when she decided to stop pursuing a graduate degree at the Graduate Theological Union and dive into more comedy. That stand-up journey has included sets at Catch a Rising Star, Gotham Comedy Club, and Caroline’s in New York City, the Comedy Studio in Cambridge and at the many Elks Lodges and Chinese restaurants in between. Offstage, Kelsey has steadily plied her trade of comedy across many platforms including as a morning-show radio host at 100.9, WRNX, and 93.9 WRSI, where she was awarded “Best Local DJ” two years in a row by the Valley Advocate. 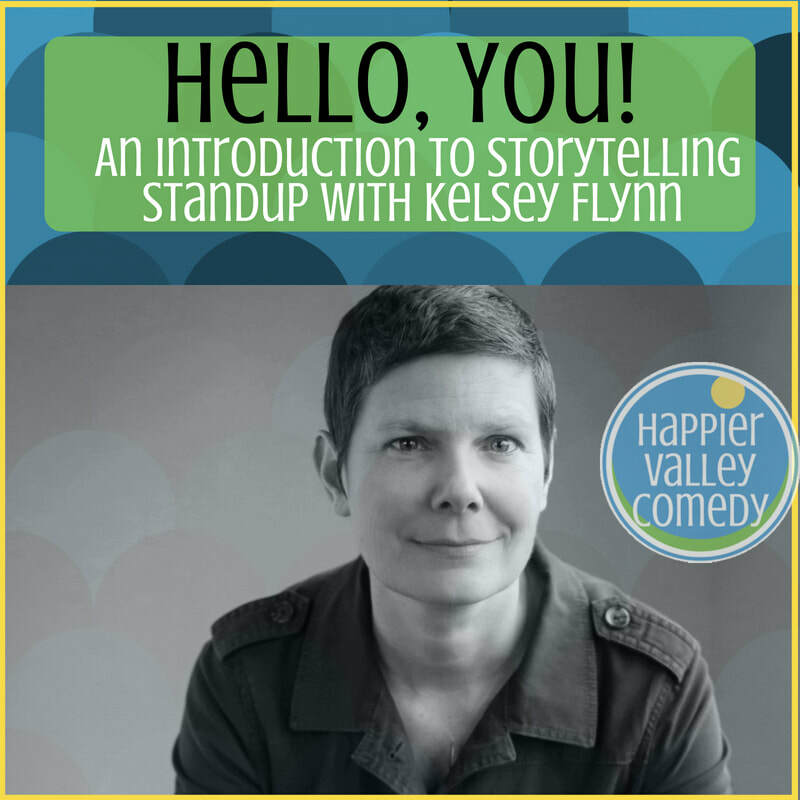 Currently, Kelsey also teaches improv for adults and kids and performs on mainstage casts at Happier Valley Comedy. *Please note that once you make your purchase, your place in the class is NON-REFUNDABLE unless we have 48 hours notice before first class AND we can get someone to fill your spot. *Students must attend at least 6 of the 8 classes to graduate to the next level. *Our classes involve physical activity, and we could be on our feet for at least an hour. If that's an issue, please let your instructor know how we can accommodate the class to fit your needs. Please email us with any questions about accommodations for ability.